The purpose of this report and treatment series was to assess response to acupuncture for nonspecific forelimb deficiencies, demonstrated by a shortened gait when turning to the right. Outcome: No significant change in forelimb issues over the course of treatment was noted; however, I suspect it would improve with a more multimodal approach and more regular treatment. Cowboy is a 9-year-old former racetrack champion who has retired to a farm where he is used for occasional dressage showing or pleasure riding. He is housed free range in a small to moderate sized paddock with two other horses. He has no documented trauma or falls from his racing days but has a shortened gait when moving to the right since current owner obtained him. 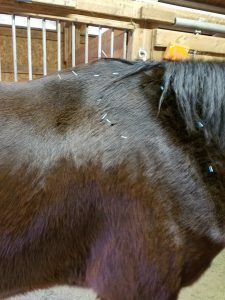 He has been examined by other veterinary professionals in the past, including a general practice equine veterinarian and a chiropractic veterinarian, and me, for acupuncture. He occasionally receives trigger point therapy and improvement is noted following these sessions. Chiropractor therapy was also pursued in the past, but no significant improvement was noted. Radiographs of both forelimbs and the thoracic spine performed 3 years ago showed no skeletal abnormalities per owner. Unfortunately, I was unable to access these radiographs and was unable to take radiographs. He has had chiropractic treatments in the past that did seem to help in the short term; however, the owner is unable to have these performed on a regular basis. Cowboy has no other known medical issues at this point. He recently had a full veterinary checkup and was found to be in good health. Physical exam & Clinical Assessments. Bright, alert response. Good for handling. On his orthopedic exam, he has decreased range of motion when moving his neck to the left. He is more resistant to raising on his left forelimb. On ambulation in a straight line, no abnormalities are noted. When lunging, the gait is slightly more shortened. When lunged, his movement to the right is choppy with more hesitation in his transitions. On myofascial palpable, restriction exists on his right caudal cervical region and cranial thoracic spine region with several trigger points. Mild pain is noted on spinal palpation. Pelvic limb range of motion is within normal limits. Thoracic limb range of motion is within normal limits. Both of his ST 7 points were not tender. The primary concerns for Cowboy were his restricted movement to the right which impacts his show career. Additionally, I also wanted to focus on overall health given his history of racing. Differential Diagnoses: Primary differential is trauma given his history as a racing horse. Other potential causes include degenerative changes or other more sinister disease (metabolic, stress, neoplasia) which are less likely given the chronicity of the problem. Treatment 1 was performed with Needles: 0.22 x 30 mm J-type Serin needles. Cowboy was restrained in crossties and distracted with mints. Points: LI 15 – used for calming as well as forelimb disease. Placed bilateral. GV 14, Bai Hui – for autonomic neuromodulation. LI 11 – used bilateral for forelimb disease. LI 16 – used for forelimb pain, bilateral. BL 13 – used for forelimb lameness, however, Cowboy was especially sensitive at these points. The remainder of the session was used to for trigger point therapy of the numerous trigger points in his caudal neck. Post-treatment palpation showed improvement in trigger points. Treatment 2: Cowboy had been a bit more active due to opening of a new fenced pasture. He has not been ridden since prior to the last treatment. No ill effects were noted from the acupuncture. No changes in his movement was noted either. Myofascial exam: Cowboy is still restricted in his caudal neck; although subjectively, he is slightly more mobile and less resistant to neck range of motion. The remainder of his myofascial exam was within normal limits. Points: Cowboy was more relaxed for the treatment today. He dropped his head and began drooling slightly. LI 15 – used for calming as well as forelimb disease. Placed bilateral. BL 13 – used for forelimb lameness – bilateral. BL 10 – for cervical pain – bilateral. BL 11 – for local pain – bilateral. BL 16-BL 14 – for local pain – bilateral. TH 14 – for shoulder pain – just right. ST 36 – for immunomodulating/overall health. The remainder of the session was used to for trigger point therapy of the numerous trigger points in his caudal neck (8 points). Treatment 3: Between session 2 and session 3, Cowboy had a farrier appointment. Unfortunately, during that appointment, his right front hoof was cut slightly too short. Following that, he was lame. Additionally, due to external complications, the time between the second and third treatment was longer than ideal. Due to these confounding factors, Cowboy was more sensitive and seemed to be more restricted in his myofascia than previous sessions. Additionally, he seemed to not tolerate treatment as well today. LI 15 – used for calming as well as forelimb disease. Placed bilateral. ST 36 – to help with the foot issues. PC 6 – to help with the foot issues. The remainder of the session was just used for trigger point therapy. We had planned to perform electroacupuncture, but Cowboy was too antsy to allow adequate treatment time. At the end of the session there was some improvement in trigger points. His neck was slightly more mobile, but hesitation was still evident on his lunging to the right and he seemed more hesitant than normal. Cowboy’s response to acupuncture was evident during the sessions but did not seem to have a lasting effect. He had great response to trigger point therapy. His issues are quite chronic, and his muscles have compensated through all these years to a point where more consistent therapy and more multi-modal approach would be beneficial. He would also benefit from a saddle fit evaluation, but this was not feasible during these sessions. Cowboy’s signs are fairly mild, but I do feel he could benefit greatly from weekly acupuncture and massage. I would like to try electroacupuncture again, running from BL 11 to BL 15 to affect the cervicothoracic and midthoracic spinal nerves. The most key aspect for Cowboy is consistent treatment, which is limited by the owners’ finances and schedule. However, treatments prior or directly after any show would greatly help his performance.